When we first heard the rumor of a kickstand for the tablet, we laughed. But actually, Apple's case/kickstand makes sense. It's made from leather, and works as both a case and stand, optimizing your movie viewing. 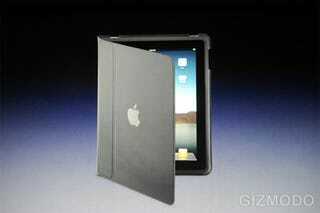 Really, it's taking the Kindle's leather case and one-upping it with the kickstand functionality. I'm going to go out on a limb here, and say that this is definitely worth buying, if you want to protect that $499 investment. But inevitably, the third-party accessories ecosystem will provide many more, cheaper cases.